The ability of particulate materials to provoke inflammatory immune responses has been well documented. In the case of endogenous and environmental particulates, these effects can often lead to pathological disorders. In contrast, particulate adjuvants incorporated into vaccines promote immune responses, which in turn provide efficient protection against infectious diseases. In recent years, studies have revealed that the NLRP3 inflammasome plays a key role in particulate-driven inflammation and its associated cytotoxicity. 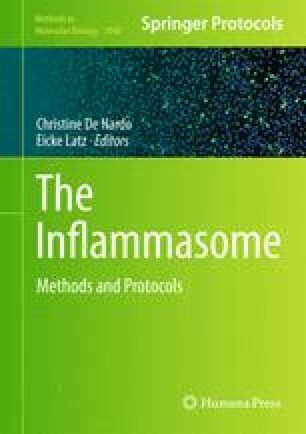 Hence, this chapter covers protocols useful to (1) assess NLRP3 inflammasome activation triggered by particulate adjuvants or materials in mouse bone marrow-derived dendritic cell (BMDCs) differentiated cultures, and (2) measure particle-induced cytotoxicity. More specifically, protocols are described for the preparation and differentiation of BMDCs, their priming and stimulation using particulate NLRP3 agonists such as monosodium urate monohydrate (MSU) and the vaccine adjuvant alum. We then detail protocols to assess particulate-driven cytotoxicity via flow cytometry using annexin V-propidium iodide (PI) and novel dye LIVE/DEAD® aqua stain. General considerations are provided that warn against the use of endotoxin-contaminated particles and emphasize the use of experimental controls. Suggestions are also outlined for further assessment of the immunomodulatory effects of particulate materials in vivo using the mouse peritonitis model.